While we tend to hear a lot about “cyberbullying”, we much less often hear the term cyberviolence. What is the difference? Why is it meaningful? Join us for a panel discussion about cyberviolence, it’s implications for girls’ and women’s equality and some important initiatives for addressing it. 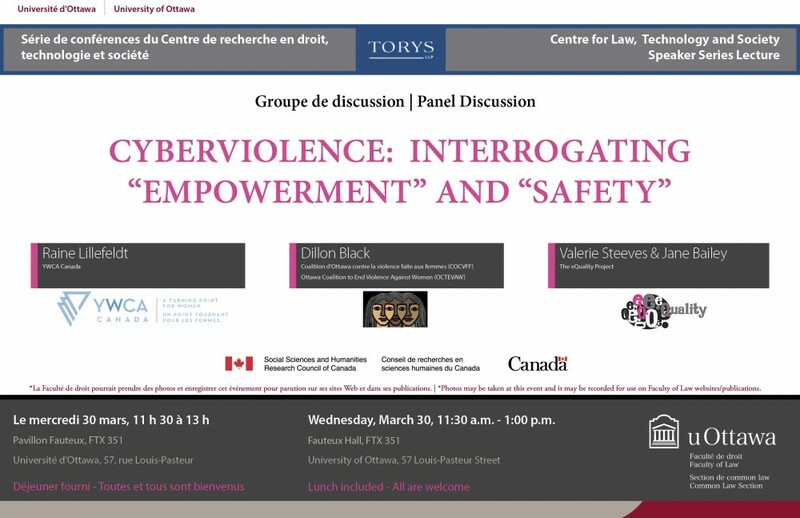 Among other things, panelists will aim to unpack some of the issues around what it means to “empower” girls and young women in online spaces, as well as the implications of the term “safety”, which is often used in this context. The importance of our choice of language: why “cyberviolence” and not “cyberbullying”? What does empowerment mean in the context of cyberviolence? How are organizations working to combat the psychological distress caused by cyberviolence? What is meant by “safety” online and how do the online experiences of women and girls affect our understanding of safety? What tools are available to combat cyberviolence? A podcast of the panel discussion is now available to download here.